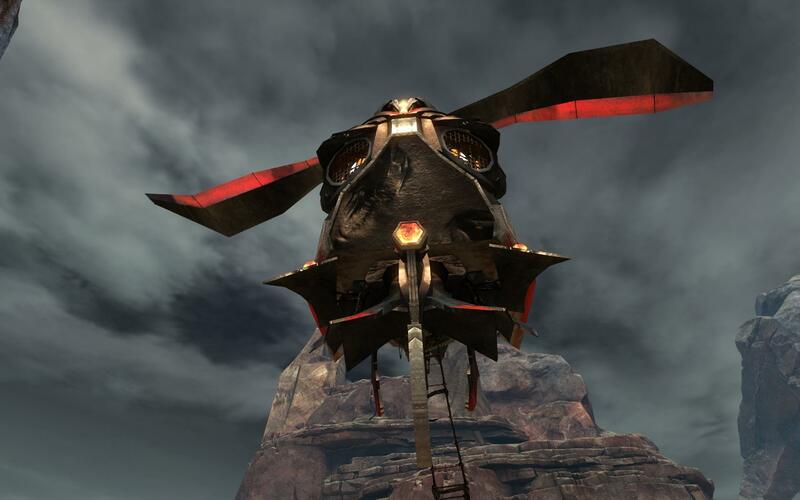 Anyone else creeped out by the eyes of the Itzel? I know I am. Buggy eyed creatures. (They’re kinda cute). The artwork and detail in Heart of Thorns looks to be amazing. I’m hoping that the Verdant Brink is the ‘worst’ of the artwork and graphics. If that’s the case, I’m going to be in jungle heaven. Trogdor the Burninator was here. So this has nothing to do with Heart of Thorns, but the fog is breathtaking. 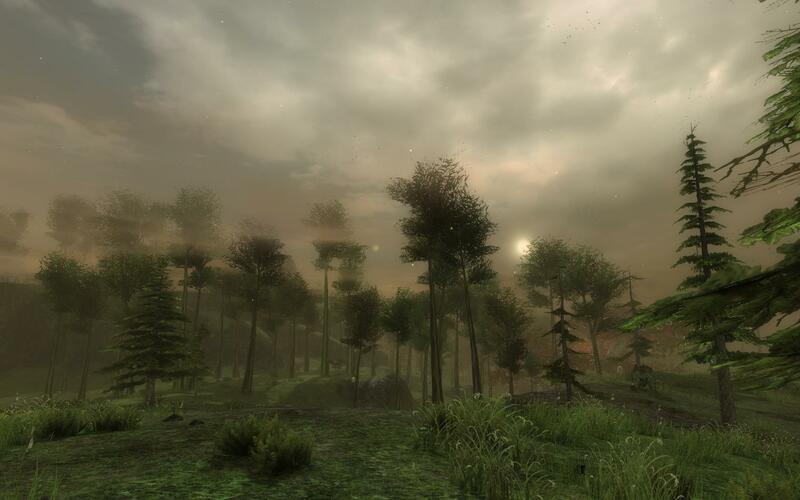 I love the entire atmosphere around the swamp in Queensdale! Getting back into doing #TravellerThursday has really helped me relive the beauty and excitement that the game brings to me. I hope it’s been doing the same for you! 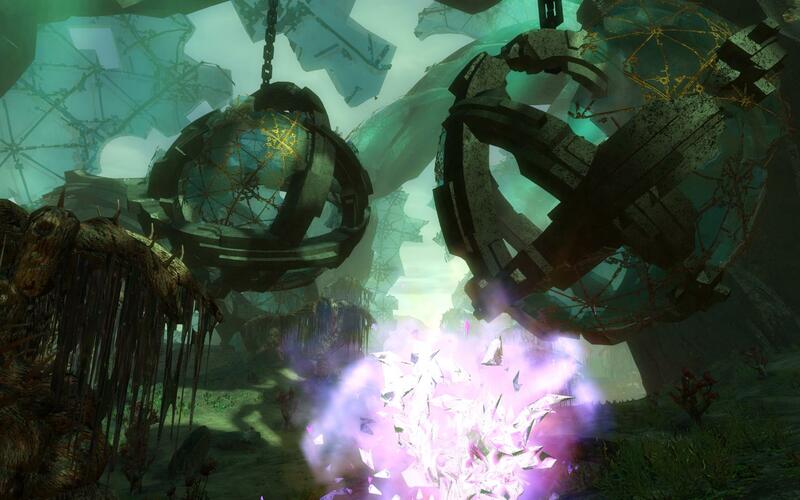 Make sure that you share your first-person screenshots with @gw2traveller with the hashtag #TravellerThursday to possibly get a retweet, and to share your experiences and sights with rest of Tyria and the Twitterverse! Yet another week of #TravellerThursday continues. 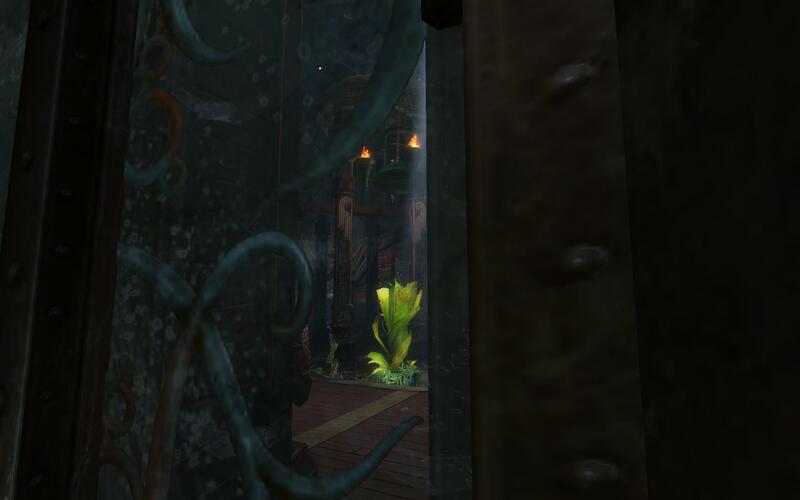 Here is a scattershot of first-person screenshots I’ve found throughout Tyria. A group of us went into Arah P4. As I tried to take a picture, my wife lovingly decided to get all mesmery. I swear, whenever you try to take a picture or screenshot, there’s always someone that has a gravitational pull towards you. I have a strange thing for ruins and architecture. I’m pretty sure this one is from AC! I WvW a lot, but I’ve never noticed these figures on the walls of Garrison. Definitely amazing detail as always. 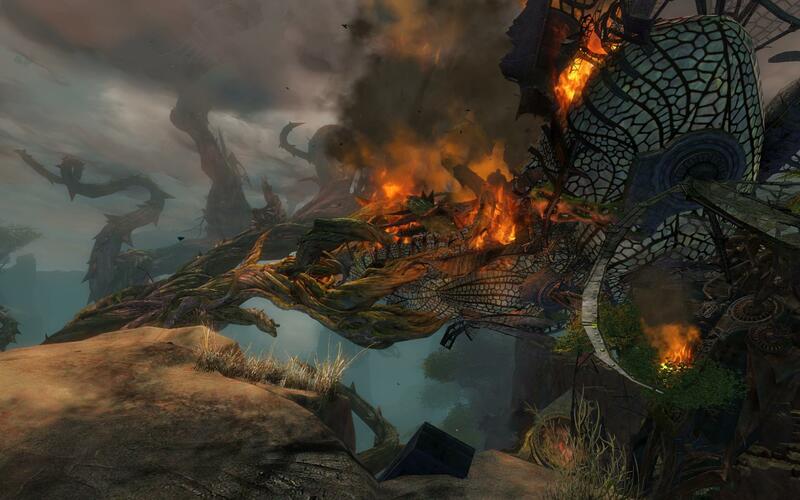 There’s a reason I love Guild Wars 2. GET TO THE CHOPPA! …that is all. All these years, and I’ve never noticed the Tengu wall near the Destroyers in Kessex Hills. It’s amazing how many details I miss, even to this day. Be sure to tweet your first-person screenshots to @gw2traveller with the hashtag #TravellerThursday to share your discoveries and sights with all of Tyria and beyond! When the new Lion’s Arch came out, I went crazy with screenshots. Here’s the new Black Lion Trading Company! I couldn’t help but peek into the Guild Headquarters. Mind you, there’s a way to sneak in there but my guildies ported me. 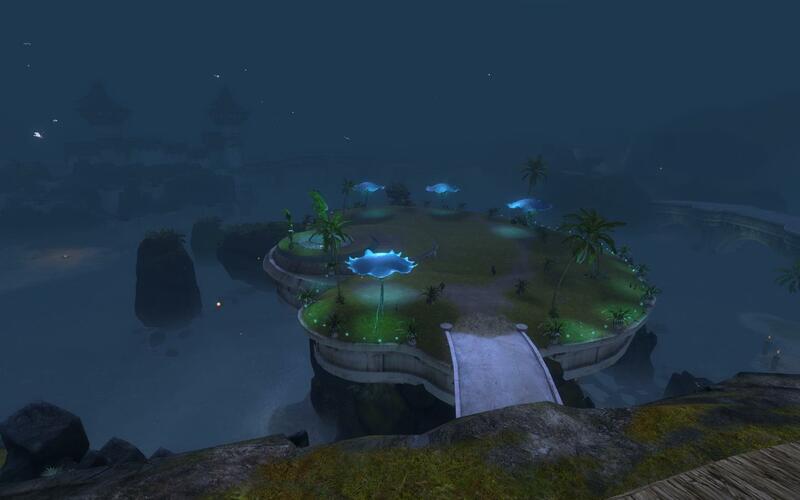 One day Omhaxx and Glorra, our Asura, shall get married there! There’s something perplexing yet mystifying about this screenshot to me. I can’t put my finger on it, but it looks strange but wonderful. 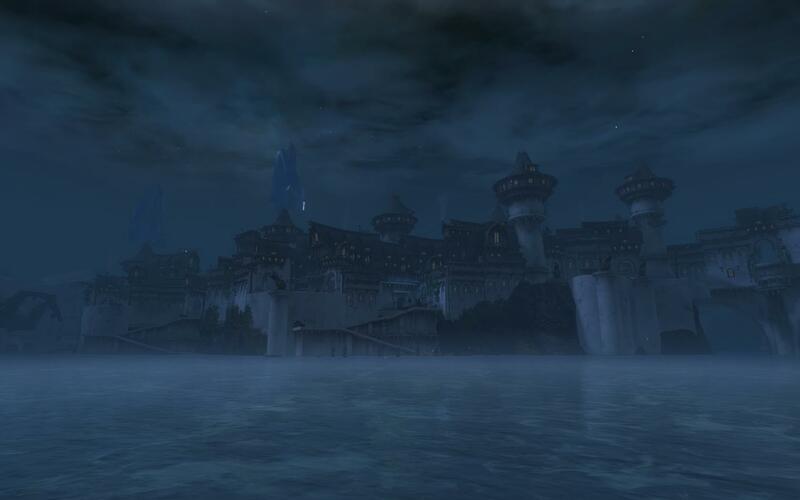 This is one of the most breathtaking views in Guild Wars 2. The sea, the gloomy air, and the beautiful architecture in the distance. I sometimes stop and stare at this screenshot for a while. And that’s it for this week! Glad to be back with you guys. Be sure to tweet your first-person screenshots to @gw2traveller with the hashtag, #TravellerThursday to share them with the rest of Tyria and beyond! For those of you who follow me on Twitter, I don’t shut up about the Revenant. 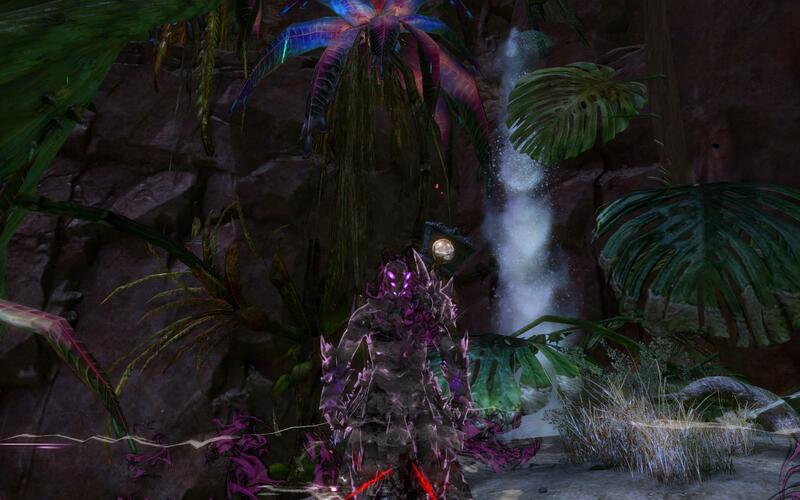 I’m pretty sure even ArenaNet employees are going to get tired of me rambling or messaging them about it. Still, I wanted to take some time to write about my experience and thoughts on the Revenant. I’ll preface it with saying that I’m pretty positive that this will replace my Guardian as my new main. I will say that I have not touched anything outside of PvE. I cannot comment on WvW or PvP for the Revenant. Although I enjoy math, in games I avoid being a min/maxer and focus more on the ‘feel’ and playstyle of a profession or class. I care more about enjoying myself than doing the most damage. “MOAR DEEPS” is not my idea of fun, and I’ll even mention throughout this blog post that I enjoy playing support more than anything, which is why I’ve mained a Guardian for a long time now. So for those looking for detailed math and what specific tweaks should happen? I’m not a developer. I don’t claim to know what will be the best changes. Still, I hope that if there are those who work at ArenaNet who read this, that it can be valuable feedback for the PvE side of things, as well as conveying my understanding of the feel. As a whole, the Assassin stance is very unique, but fills a gap I didn’t expect from the Revenant. It has an in-and-out feeling, but seems to lack in the healing department. It’s definitely DPS-focused, and it’s an element the Revenant was severely missing in the last weekend event where we could play Revenant. 6 (Enchanted Daggers) – An interesting heal that feels very strange to me unless I’m running Dagger. I feel like it really doesn’t do enough to heal me up, and isn’t worth me using. Because of this, it makes Shiro feel a little weak to me on the self-heal department. Then again, I think they were aiming more for mobility, forcing you to step out for a better heal. 7 (Riposting Shadows) – I need to learn to use this more. The specific conditions it deals with are a good thing. I love the stun break, and the evade, along with the endurance gain. Honestly this one is so unique that I barely used it, as it would take me time to get used to it. It felt really good when I used it right though. 8 (Phase Traversal) – So I honestly might’ve been running Shiro just for this skill. BAM. Shadowstep. Sure, something about unblockable and some damage (which are very welcome), but that shadowstep alone really made the difference for me in this legendary stance. 9 (Impossible Odds) – Slaughter fest. Stack up enough energy and you’ve got quickness and super speed coming with every tick? I love running it with staff so my auto is dropping healing orbs nonstop. I also loved it with sword, slamming out quite a bit of damage. My biggest problem is forgetting to pay attention to my energy, so I end up having to swap out instead of being able to use skills I wanted to. 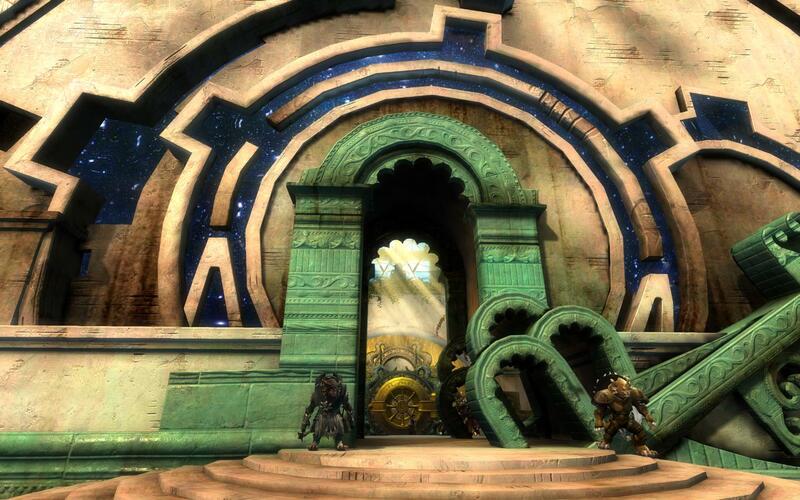 0 (Jade Winds) – A *very* cool skill that hearkens back to Guild Wars 1. I was impressed by it, but don’t see much value for it in dungeons. I wrestle with whether it feels very ‘elite’ or not to me. Does it have a lot of value? I think more value in PvP and WvW for sure. PvE? Not so much. I’m not convinced it needs to be tweaked much, but I’m sure others would have better insight. I actually find this extremely fun. Some people complain about having to move your tablet around constantly but as I use a Razer Naga, I find it very engaging. It’s probably the degree of engagement that makes me want to use this all the time. Of course, I adore support. 6 (Ventari’s Will) – Move the tablet, heal some people, and if traited you’re getting Regen around the thing too? Yup. I’m good with that. Makes sense. 7 (Protective Solace) – I love a toggle skill that reflects projectiles. Very strategic, and I can see it being great in PvE. 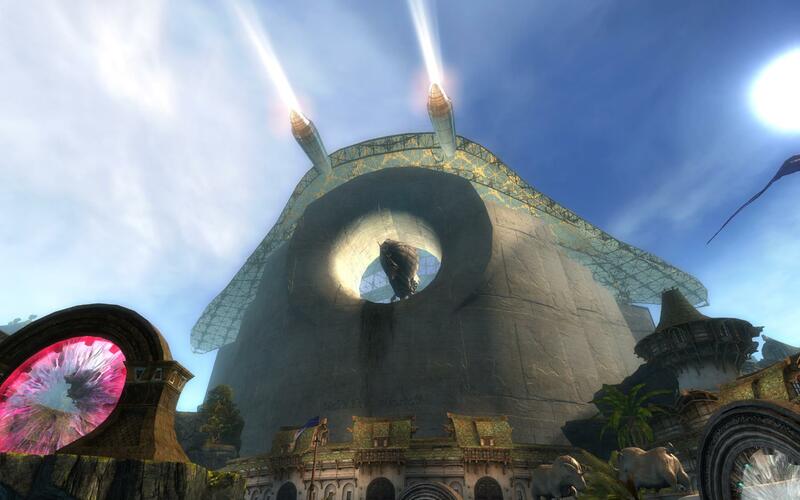 I’m not convinced Ventari as a whole will be useful in WvW or PvP, but who knows? 8 (Natural Harmony) – I wish this skill would heal for a larger amount and have a longer CD. Otherwise I feel like I’m just moving with 6 and hitting 8 almost every single time. It doesn’t feel as strategic as it should be. 9 (Purifying Essence) – A great condition cleanse that heals for every condition removed. Works for me, and I used it frequently. 0 (Energy Expulsion) – Blow it up, knock things back, drop big orbs that heal for quite a chunk. Feels very good, and in Ventari stance it seems energy is easy to keep up so 50 isn’t a big deal. I have to get used to using this more often. 6 (Soothing Stone) – A standard heal that feels familiar, cleansing conditions. You gain retaliation for each cleansed condition, which is quite nice. 7 (Inspiring Reinforcement) – I love how this skill looks. The best part is the stability and weakness that it gives/causes. Frankly, I love using this in a group and find it’s really easy to spam, as it’s on a 5s CD. One of the best parts of the Dwarf stance. 8 (Forced Engagement) – I’m still not used to the taunt thing, and I barely used this skill. I can’t really comment as to why. It just didn’t seem valuable to me while in larger groups. It could be very useful in PvP. 9 (Vengeful Hammers) – This is crazy amounts of fun, but it does drain energy pretty quick. Only good if you’re in melee, but I used it quite a bit. I admit though, I had to be pretty conscious about using it, as I’d often forget. Happy that it’s a toggle. 0 (Rite of the Great Dwarf) – Love the reference. I do find that the cast time makes me avoid using it most of the time, and 50% dmg reduction to normal attacks doesn’t really seem appealing. It feels rather underwhelming to me as a whole, so I barely used it. I have to admit that the Demon stance doesn’t really click with me much and I have a few reasons why. (Side note: I felt like I was playing a bit of a condition necro while in this stance). It doesn’t seem like a good PvE stance, as I find I’m not slammed with too many conditions. WvW on the other hand, I could have fun with this as I do WvW almost every night. 6 (Empowering Misery) – Gain more healing per condition. I hate self-weakness, I must admit. I get why it’s there, but it drives me bonkers. 7 (Pain Absorption) – Resistance is a unique thing to get used to, and is quite helpful if you’re dealing with a lot of conditions. Self-blind is no big deal as it’s only one hit. 8 (Banish Enchantment) – I get spam-happy on this as I love stacking confusion. Removes boons, it’s unblockable, and hits multiple targets. Probably the best part of the Demon stance. 9 (Unyielding Anguish) – I have issues with knockback or displacement in this game. It’s an insane pet-peeve of mine with how many people knock things out of giant stacks of AoEs because it’s mindless. This skill does that very thing, screwing up group content. Maybe in PvP or WvW it could be a lot of fun, but I find it’s just a royal pain in PvE. Torment is great, yes, but I just don’t get this one. Of everything the Revenant has, this is the one skill that I think was a cool idea but in practice? I think it’s going to be dubbed the new “Ranger LB 4 (aka Point Blank Shot).” We will curse the name of Unyielding Anguish throughout 2016 if this stays. 0 (Embrace the Darkness) – I’m a freaking margonite. I’m amazing. I love the graphics of it. 10% to all stats is definitely a bonus. Copy conditions with each tick? PvE once again it’s not so valuable, but I could see its strategic value. Overall, I found that sword was ok. It wasn’t my favourite, but that’s just personal preference. It has a lot of value and can be used quite effectively for DPS and the like. It wasn’t where I spent my bit of time this weekend. 1 – Pretty standard auto-attack. I quite enjoy it. The range on the second hit is very strange. I could see it having some value though with enemies that move around a bit. 2 (Precision Strike) – This feels strange to me. It feels like it doesn’t do a tremendous amount of damage, and the Chill doesn’t feel like it’s worth it. 1s of Chill doesn’t seem to have much value, if you ask me. 4 second recharge isn’t very long, but I’m not sure I personally felt like it clicked. 3 (Unrelenting Assault) – This seems quite damaging, and I love that you can get might from it. 4 (Duelist’s Preparation) – Quite good. I actually enjoy the defensive element of the off-hand sword. 5 (Grasping Shadow) – Didn’t play with this enough. I spent most of my time again in Staff. It feels like the damage has gotten quite buffed, and the support capability while in melee is exactly what I’ve been wanting to play. I’m in love with it. 1 – Damage, damage, damage and healing orbs. Most people hate healing in this game it seems, but I actually love this little tiny boost. Mix that with Impossible Odds (Shiro Legendary 9) and that’s quite helpful in groups. I felt like it really helped when grouped with my wife. 2 (Punishing Sweep) – This feels awkward to me. I enjoy that I can sometimes inflict weakness through Debilitating Slam. 3s of it is quite effective, imo. I also enjoy Melee AoEs, so it’s right up my alley. 3 (Warding Rift) – I love this. I adore this. The reflect has to be fairly timed, and the blind is great. 4 (Renewing Wave) – These are the types of skills that I adore. 2 conditions cleansed on a 15s CD while also providing healing? Yes please. I’m a player who enjoys playing support, and it gives some flexibility with some of the legendaries. Mace is very much a condition weapon but still seems to have a bit of damage to it. 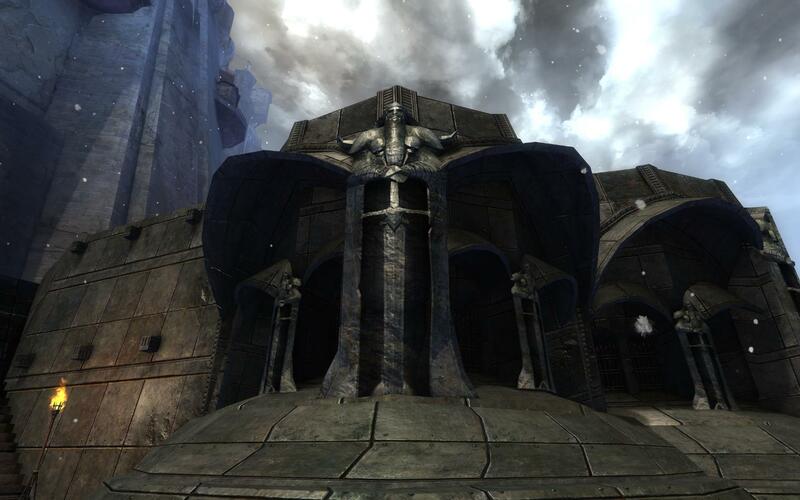 It’s not a condition weapon like the Necromancer’s scepter. I’m not sure what to relate it to. 1 – Torment and Poison on the auto-attack? Yes please. I didn’t even try a condition-based Revenant, and I found this powerful in PvE. 2 (Searing Fissure) – Fire Field? Burning? Nice area in front of you? I love it. I felt like this was quite damaging. 3 (Echoing Eruption) – Blast finisher? You mean I can drop a fire field and then blast might with the same single weapon? Yup. I’m game. This is a huge draw for me. Plus hey, more torment. Axe offers some condition and mobility that I find to be quite effective. 4 (Frigid Blitz) – The chill on this is ok, but it’s the shadowstep with the final blow of damage that really draws me in. They buffed axe, and it feels very in-line with where it should be. Pairs well with sword, imo. 5 (Temporal Rift) – Ok, so I admit that didn’t even know what this did. I just kept using it because it looked so cool. Torment and a pull? I actually didn’t notice if enemies were pulled in or not. I just loved the torment and damage from it. Feels very clean, easy to use, and works. 1 (Hammer Bolt) – It feels clunky, but deals some nice damage for being ranged. I like that it penetrates and hits up to 5 targets (untraited Ranger LB drives me insane for that). The projectile finisher can be paired with skill 4 (Field of the Mists) for constant Lifesteal. Throw in Shiro’s 6 (Enchanted Daggers) and you could possibly have some nice self-healing there from range. 2 (Coalescence of Ruin) – 2s CD for some spammy fun. I still haven’t gotten used to where the damage really takes place, but it’s clear that hammer encourages you to really stay at range. It’s built to live somewhere between burst and sustain for damage. I’m not sure how I could see this weapon being effective in PvP, but for PvE this is a great skill. I think it just takes some getting used to. 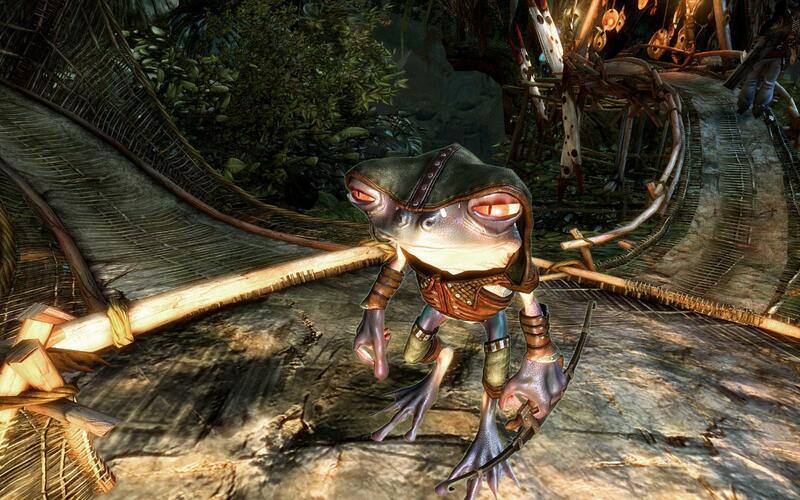 Frankly, I think ANet are thinking outside the box for this. 3 (Phase Smash) – This feels strange. Rooted… sorta… because you’re flung ahead and slam down into enemies for a blast finished. It’s nice to really aim your blast finisher from a distance though, because I’m pretty selective over what fields I want to hit. The chill and damage feel on-par for me. I’m actually surprised at how damaging the hammer feels now compared to before. 4 (Field of the Mists) – Fun mechanic of a wall that moves in front of you wherever you turn, blocking projectiles. As I mentioned before, it’s also a movable Dark Field. Talk about fun for Lifesteal. 5 (Drop the Hammer) – Such a long cast time, it seems. I get it because you wouldn’t want someone getting this out too quickly for a blast finisher and a 2s knockdown on enemies. It’s hard to hit with on moving enemies, but it only has a 15sCD. Frankly, I love how low the CDs are on the Hammer. I always carry one. After playing the Revenant on and off throughout the weekend (and having my friends wonder why I’m not really playing the Dragonhunter as I main a Guard), I find that it’s feeling really good. It’s hard to really get a good understanding of the skills or trait lines for me when I don’t get much time to play it. The traits, I barely even touched, although it seems to make a lot more sense than the last time around. I think it’s in a better place, and I’m looking forward to where they’re going with this. To play from 1-80 will give me a much better feel of the Revenant and really train me in how they ought to work. I love the flexibility, the ability to support and DPS. I love that you can use conditions, and I’m extremely pleased with the ability to weapon-swap. Best decision they could’ve made for the Revenant. It made the profession come alive for me. Ultimately, I find the Revenant can be summed up with the word “Strategic.” You clearly have to know what you’re doing and why you’re doing it in terms of the legendaries. I’m thankful that there is now a profession that makes me want to use the utilities instead of just hold off on it. 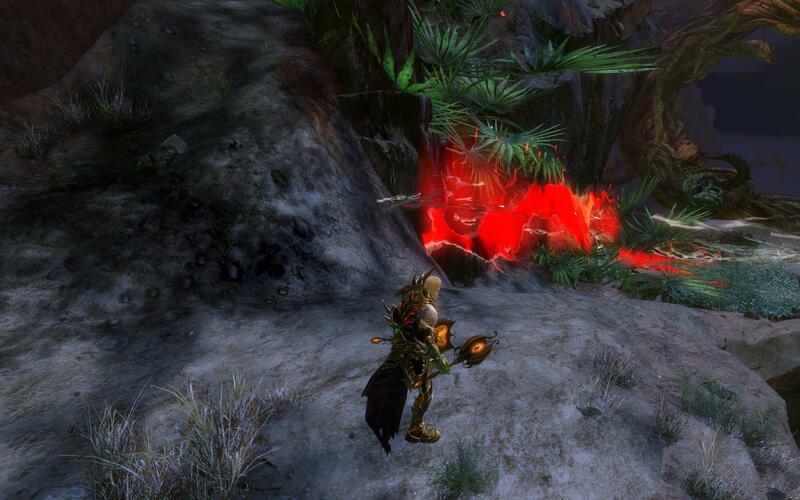 The energy system has refreshed my love for the future of Guild Wars 2. I’m in love. 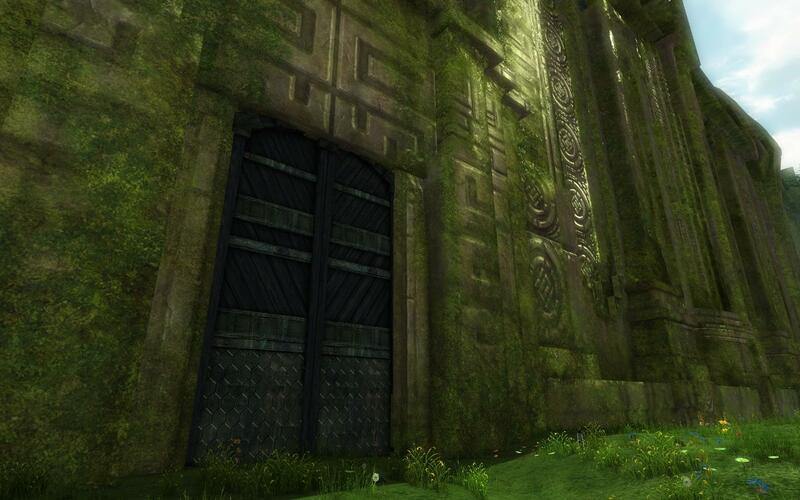 The Traveller of Tyria is an unofficial Guild Wars 2 fanblog. 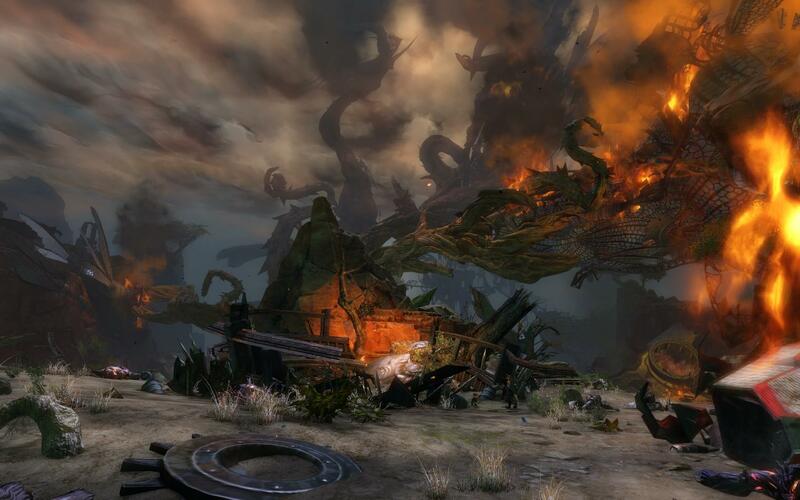 All screenshots, concept art, and logos are ©2012 ArenaNet, Inc. All rights reserved. NCsoft, the interlocking NC logo, ArenaNet, Arena.net, Guild Wars 2, and all associated logos and designs are trademarks or registered trademarks of NCsoft Corporation. All other trademarks are the property of their respective owners. 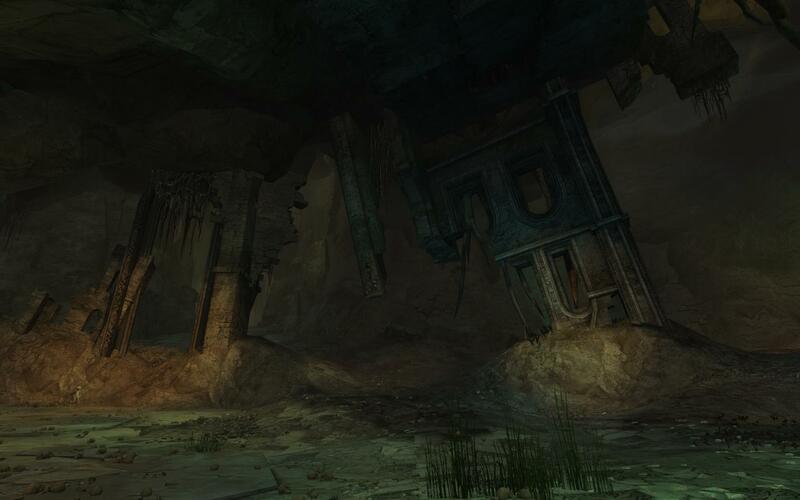 Original artwork, videos, articles, other content, and intellectual property ©The Traveller of Tyria.